In case you missed NLR’s piece on Chelsea author Carey Wallace, I am again posting it below for your enjoyment. Ms. Wallace will appear at the Borders Lohr Road location in Ann Arbor for a reading and signing of her wonderful novel, The Blind Contessa’s New Machine. This event is scheduled to take place on Friday, July 30, 2010 at 7:00 PM. As always, call and confirm all event details before heading out the door. These were a mere few of my many thoughts upon finishing the book The Blind Contessa’s New Machine. Needing to know more about the genesis of this stunning slip of a book, I took to the site of author Carey Wallace. When I realized that Carey Wallace had grown up in several small towns in Michigan, I managed a lovely exchange with the author and found out that she spent her elementary school years in Hillsdale where her dad was a professor before moving on to graduate from Chelsea High School. While Wallace currently resides in Brooklyn, she considers Chelsea her hometown and shares the sweet fact that “the more time I spend there as an adult, the more remarkable I find it.” Ms. Wallace credits the dedication of former teachers who were “fully supported by a community that deeply valued the arts” for her deft skills as a writer and creative. With Ms. Wallace’s sincere responses to my queries, it was easy to hear the echo of Contessa’s fleshed and heartfelt characters. If she had any program in The Blind Contessa’s New Machine, she says, it may have been this: to challenge materialism, to complicate the seen world’s claim to be “reality”, and to encourage people that their sense that “there must be more than this” is not only accurate, but the foundation of all truth. The Blind Contessa’s New Machine appears on the July 2010 Indie Next List. Check back with NLR for a full review later this week. Carey Wallace also runs ‘The Hillbilly Underground.’ In its tenth year, the Underground is an arts retreat that welcomes a diverse group of artists to the Michigan lakeside for a precious ten day block of undisturbed creative freedom. A quick trip to the site of Rafe Esquith will fill you in on the man known to teach like his hair’s on fire. Now the celebrated educator returns with his latest book, Lighting Their Fires: How Parents and Teachers Can Raise Extraordinary Kids in a Mixed-up, Muddled-up, Shook-up World. 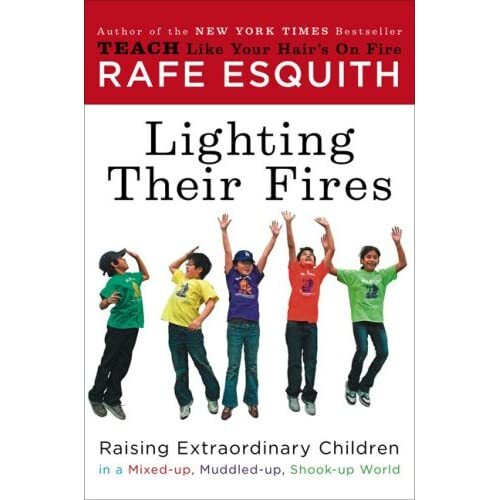 “Esquith expands on the techniques presented in Teach Like Your Hair’s on Fire to show that any child can become extraordinary,” states the B’ham Borders site. For more on Esquith and his concepts, try this NPR segment Rafe Esquith Offers His Fiery Teaching Methods. Borders in Birmingham will host Rafe Esquith for a hot reading and signing of his latest work this Wednesday, July 28th at 7:00 pm. As always, confirm all information before heading out the door as details are subject to change. NPR asked audiences last month to submit nominations for a list of the 100 most suspenseful novels ever. After receiving some 600 titles, NPR’s panel of thriller writers and critics has narrowed the list down to a still hefty, but manageable 182 novels. I’m so happy to say that author Harry Dolan made the list for his clever Ann Arbor mystery, Bad Things Happen. I read Mr. Dolan’s book late last year and absolutely loved it. You can read NLR’s review without any fear of plot spoilers and catch the book’s trailer here. For the full NPR article and a chance to weigh in, link to ‘Killer Thrillers’: Vote For The 10 Best Ever. You can cast your vote and submit as you please, however, don’t overlook Michigan’s beloved Elmore Leonard; he hits the list with Killshot and Road Dogs. You can check out more on these two titles with the following links to the Killshot movie trailer as well as the book trailer contest for Road Dogs. When I realized that Carey Wallace grew up in several small towns in Michigan, I managed a lovely exchange with the author and found out that she spent her elementary school years in Hillsdale where her dad was a professor before moving on to graduate from Chelsea High School. While Wallace currently resides in Brooklyn, she considers Chelsea her hometown and shares the sweet fact that “the more time I spend there as an adult, the more remarkable I find it.” Ms. Wallace credits the dedication of former teachers who were “fully supported by a community that deeply valued the arts” for her deft skills as a writer and creative. While stopped at a traffic light yesterday, I noticed a puttering station wagon next to me with a little old lady in a floppy gardening hat behind the wheel. I could just make out her profile as she peered out her windshield patiently waiting for the light to change. My obstructed view was not due to her petite stature or an advanced stage of osteoporosis, mind you, but rather from the climbing stacks of old newspapers, rotting stuffed animals, cardboard boxes, blankets, and foils in differing states of decomposition; overall, a stockpile that threatened to bust out the windows and swallow her whole. 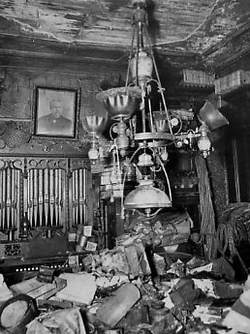 Fiction often intersects with my reality, and it was at this moment of observation that I was tossed back into the Fifth Avenue home of the Collyer brothers. Homer & Langley, E.L. Doctorow’s jaw-dropping tale, was my first real insight into the pathos of hoarding and the uncontrollable obsession with accumulation. Based on this fiction, my mind soared with the endless possibilities of what might await on the residential end of this little lady’s drive. However, instead of being horrified by this mobile compost and thoughts of her potentially toxic home, Doctorow’s Homer & Langley offered me the possibility to translate this scenario into one of knowledge, creativity, compassion, and empathy. And isn’t that, after all, the true gift of a book? According to his bio Mr. Berger has written articles for The New York Times, The Los Angeles Times, and The Chicago Tribune among many other well-known publications. These days however, he is busy promoting his thriller, which must be a full time job in its own right. In the literary world things are really ramping up on the Internet, and Berger’s site for The Purples is no exception. Just when you thought getting published was the hurdle, authors must now hone their promotional and marketing skills to visually compete online. A definite nod must go out to The Purples site which (though it pains me to say) includes a very decent trailer. Though I haven’t yet read The Purples, I am thrilled at the prospect of another historically based book shedding light on Detroit and its incredibly diverse history. For past NLR reviews that touch on these subjects, try Annie’s Ghosts, Grand River and Joy, and The Art Student’s War. While my friends were Kicking the Hornet’s Nest with Stieg Larsson last weekend, I spent the holiday on Starvation Lake with author Bryan Gruley. Forget the fact that I was basking in the sun and under deadline to review an entirely different book, Gruley had me tensed and trudging through the freezing, knee-deep snows of northern Michigan. Hockey is the perfect metaphor for Gruley’s ever-curving plot, and keeping your eye on the puck is a challenge well worth taking. When the missing snowmobile of Starvation Lake’s famed former coach mysteriously resurfaces along its icy shores, it elicits an eerie restlessness from the locals, and as the ensuing investigation’s forensic evidence bubbles to the surface, so too do the bizarre and inconsistent events leading up to the coach’s demise. Starvation Lake is stacked and immediately flicks on the mental projector, leaving no doubt that this mystery could easily make its way to the big screen. Gruley’s characters are beautifully fleshed-out; gritty in their resilience and painfully true to their struggling small town. His characters are familiar enough to enchant yet remain deeply private, casting just enough doubt as to who the playmakers of Starvation Lake really are. In essence, Gruley has set up the perfect whodunit. For those of you who know nothing of hockey or its superstitions do not be deterred, this mystery reads well regardless. 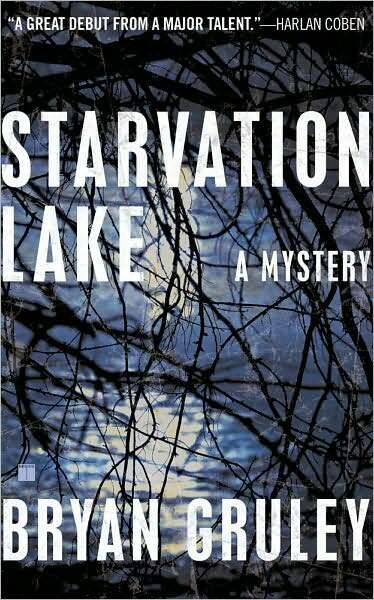 Though Gruley’s dialogue and setting have serious midwestern appeal, Starvation Lake has range and doesn’t fall short crossing over. A tight story of friendship, hardship, and redemption, Mr. Gruley has crafted a fine mystery revolving around both the rink and the larger arena of life. -I first stumbled upon author Bryan Gruley while I was checking out The Edgar Nominees for 2010. One thing led to another, and I quickly realized that Mr. Gruley is one of Michigan’s own. According to the book’s reading group guide Bryan Gruley grew up in Redford, “a blue-collar suburb abutting Detroit on the west side.” As for the setting of his novel? It is based on the areas surrounding the author’s childhood cottage on Big Twin Lake in northern Michigan. -Bryan Gruley’s site for Starvation Lake is really unique. My personal jury is still out due to the fact that I pulled it up after reading the book and the forced voice and visuals toyed with my conceived sounds and images of the story. It is definitely worth checking out as authors get more aggressive and creative with their marketing. You can check out the Starvation Lake site here.